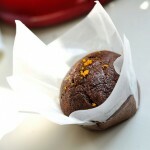 I’ve been experimenting lately with alternative ways to sweeten our food. I mean, there’s no way around sugar for everything, but as a web designer I’m fascinated (read: borderline obsessed) by the different ways to bake to improve the nutrition of what we eat. 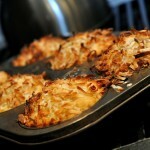 Plus, let’s face it, good maple syrup tastes amazing! This recipe is a variation of one I found among some old notecards at my mom’s house. I have NO idea where it came from, but kudos to the creator as it’s become a template recipe and starting point for a lot of the quick breads and muffins I’ve baked. 1. 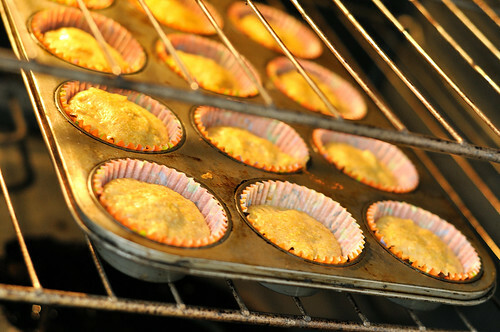 Preheat the oven to 375 F. Grease or line 12 cups of a standard muffin tin. 2. In a large bowl, blend the butter and syrup. Add the eggs and bananas. Mix in the remaining ingredients. 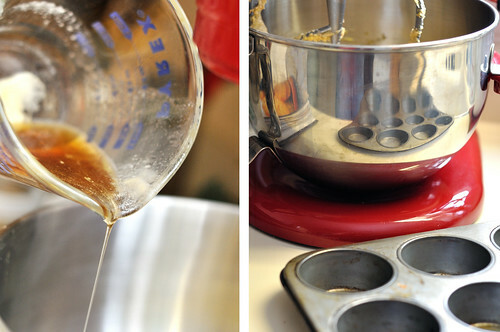 Pour the batter into the prepared muffin tin. 3. Bake 16-18 minutes, until the muffin tops are golden and a tester inserted into the center of the muffins comes out clean. Transfer to a rack and cool. 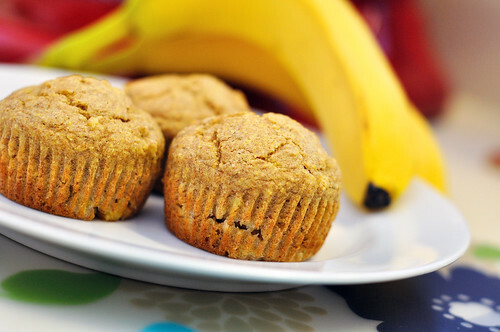 A muffin that tastes like banana pancakes! 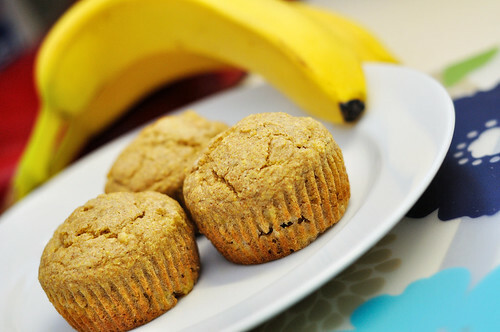 They are lightly sweet and taste mostly of the banana. Since I’ve been under the weather, they were super easy to throw together and ready in under an hour. In future batches, I’d like to know how they taste with agave nectar in place of the maple syrup, since agave is sweeter than sugar and maple syrup is roughly 60% as sweet as sugar. 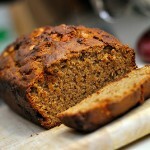 I’ve never baked with agave nectar, do you find it to be too sweet or just right to substitute in baking? This look beautiful! 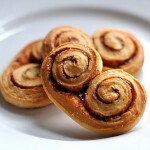 I have put them on my “to bake immediately” list! I use agave nectar a lot. I’m iffy on honey and good maple syrup is often too expensive (here, anyway). I usually use agave on my pancakes. 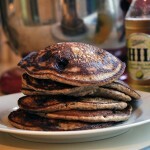 I make pretty hearty pancakes (whole wheat a flax) so the extra sweetness is nice. Also, that should say “these look beautiful.” Oops! These look fantastic! And I love the pictures!! Thanks guys! Chrissy, I definitely think I’ll be picking some up soon. I’ve passed it in the store several times, and only now have really investigated what its all about. 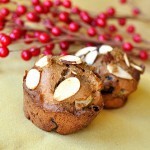 If I can have sweetness to offset some of the more hearty, whole-grain rich foods I’m making, it’s a win win for sure! They sound amazing. 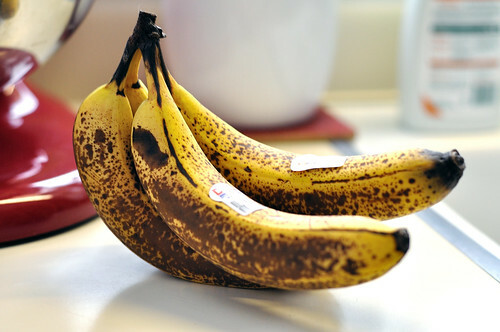 I’ll have to try these next time I have brown bananas!